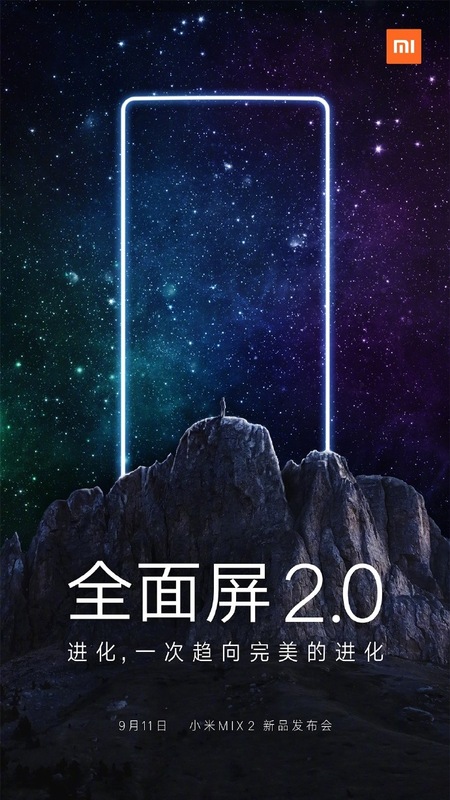 Xiaomi has officially posted a teaser on Weibo regarding the launch event of Mi Mix 2.The teaser confirms the launch date which is September 11th. Xiaomi launched Mi Mix last year which created a lot buzz in the smartphone world and all the companies are going for bezel-less display these days. Around two weeks ago, a concept video was officially posted by the Philippe Starck suggests that this year Mi Mix 2 will have even thinner bezels compared to Mi Mix. The screen-to-body ratio is expected to be 95%. The rumors are suggesting that Mi Mix 2 will come with Dual rear cameras this time. It is also said that the handset will have 3D face recognition support. According to the benchmark reports, Mi Mix 2 will have a 6.4-inch AMOLED display with a resolution of 2540×1440 pixels. The device is expected to be powered by Snapdragon 835 SoC, 6GB RAM, 4,500mAh battery, and Android 7.1.1 Nougat with MIUI 9 on the top. The device might come in 128GB and 256GB variants.